ORLANDO – The more things change, the more they stay the same really. Same book, just different chapter. 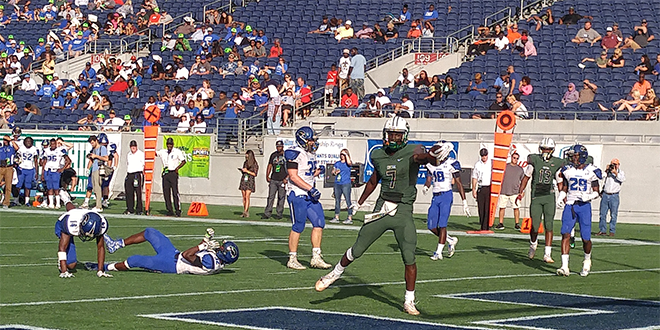 Minus the names on the back of the jerseys and the occasional coaching change, the one constant thing that remains is Miami Central whooping Armwood to win another state title. Central cruised to its fourth state title in a row and its fifth out of the last six years, with a 48-13 win over Armwood in the Class 6A state title game at the Citrus Bowl. The game started on the right foot for Armwood (14-1) as the Hawks defense stopped Central on its opening drive after chewing up six minutes off the clock. From its own 10, Erin Collins (141 yards on 5 carries) busted up the middle and went 90 yards untouched to give Armwood an early 7-0 lead with 5:13 left in the first. That would be the only lead for Armwood as Central reeled off 29 unanswered points to take a commanding 29-6 lead. Allen Jones returned a fumble 90 yards, quarterback Jerrod Thomas snuck in from a yard and James Cook (179 yards and 3 touchdowns on 15 carries) rumbled 28 yards to put Central up 21-6 with two minutes left till half. That would have likely been the halftime score if not for a stupid personal foul call on Dedarallo Blue for taunting Thomas after a sack. The flag gave Central a first down and extra 15 yards which resulted in Thomas hitting Carmoni Green for a 46-yard touchdown pass on the final play of the first half giving Central a 29-6 halftime lead. Armwood fielded the second half kickoff and was leveled giving Central the ball inside the ten. Cook scored his second touchdown on a 6-yard run increasing the lead to 35-6. Darian McNeal temporarily stop the bleeding ending a 35-0 run with a 3 yard score cutting the lead to 35-13 with 7:24 left in the third. However, like they have done the last 5 years, Central closed it out with a 13-0 run as Cook raced 57 yards untouched down the Armwood sideline and Thomas (13 of 19 for 156 yards and 2 touchdowns) found Darnell Salomon for a 12 yard pass with 4:01 left in the game to close out the scoring. The win put Central (12-2) into a small group of teams who have won four consecutive state titles joining Suwannee, North Florida Christian and Booker T Washington, who joined the elite group last week with a win over Raines in the 4A title game. Central also moved within one trip of tying the state record for consecutive state title game appearances, which is owned by Glades Day, who made seven consecutive appearances from 1982-1988.